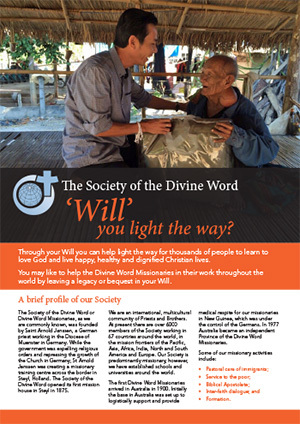 Through your Will you can help light the way for thousands of people to learn to love God and live happy, healthy and dignified Christian lives. You may like to help the Divine Word Missionaries in their work throughout the world by leaving a legacy or bequest in your Will. The Society of the Divine Word or Divine Word Missionaries, as we are commonly known, was founded by Saint Arnold Janssen, a German priest working in the Diocese of Muenster in Germany. While the government was expelling religious orders and repressing the growth of the Church in Germany, St Arnold Janssen was creating a missionary training centre across the border in Steyl, Holland. The Society of the Divine Word opened its first mission house in Steyl in 1875. We are an international, multicultural community of Priests and Brothers. At present there are over 6000 members of the Society working in 67 countries around the world, in the mission frontiers of the Pacific, Asia, Africa, India, North and South America and Europe. Our Society is predominantly missionary, however, we have established schools and universities around the world. The first Divine Word Missionaries arrived in Australia in 1900. Initially the base in Australia was set up to logistically support and provide medical respite for our missionaries in New Guinea, which was under the control of the Germans. In 1977 Australia became an independent Province of the Divine Word Missionaries. Making your Will is very important. It is the way that you can make sure the interests of your beneficiaries are protected and that your assets are distributed as you want them to be. When planning a Will the financial implications for your family are very important. As well as deciding who is to benefit and how, you need to determine who is to be your executor, who should be guardian for any minor children and what charitable interests you want to support with a final gift. After a lifetime creating a satisfying and fulfilling life for themselves and their family, many people reach their later years wishing they had been able to do more to help others. Fortunately, it’s not too late—a simple bequest to Divine Word Missionaries in your Will could mean a whole new life for someone or a whole community somewhere in the world who still lives a hungry, unhealthy, undignified life of despair. A few will get the chance to rise above their poverty and make better lives for themselves and their families—thanks to your help and the work of Divine Word Missionaries around the world. Train young men who wish to become Divine Word Missionaries and spread the Word of God and His great love by their actions. If you would like to help the Divine Word Missionaries in their work by leaving a legacy or bequest in your Will, retain this form of bequest and give it to your solicitor when having your Will prepared or updated. Specific - You nominate a specific sum of money or item of property to be left to a particular beneficiary. Proportionate - You nominate a specific portion of your estate to be left to a particular beneficiary eg. 10% or 1/3 of your estate. Residuary - You nominate the remainder, or part of the remainder of your estate after all other bequests have been settled. Whichever way you choose, we hope that you will remember God’s work and the Society of the Divine Word in your Will. This brochure is for your information only and you should consult with your solicitor or trustee organization in respect of making your Will and administration of your estate.